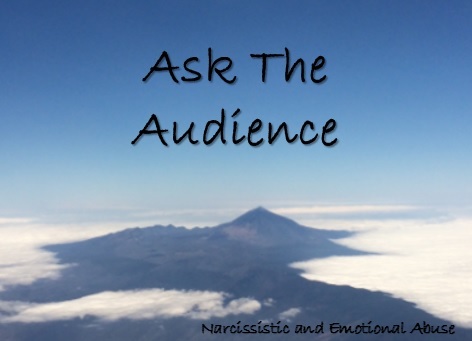 I’m wondering, how do you cope with losing friends to the narcissist? I don’t mind losing the friends who my ex knew first, but there are people who used to mean a lot to me, my friendships into which my ex insinuated herself. When things got tough, she turned to some of them and, of course, they’ve taken her side because she’s charming and plays the victim. I know if I tell these people what really happened I’ll sound “crazy,” just like my ex likes to describe me, and I also value being the grown-up in the situation and not trying to bad-mouth my ex. I know that the truly decent people are able to accept that there are two sides to a story. I’m just so hugely disappointed in the once-close friends who have ghosted me after hearing my ex’s side of things but not mine. How do you make peace with this? I’m sorry you’re going through this most difficult time as you transition out of your relationship with your NPD partner. The time spent in such a relationship changes a person who has been manipulated and controlled by the NPD partner, who has even controlled who you were allowed to keep, controlled which of your family and friends were allowed to remain during your relationship. The ones that were kept were the ones who did not threaten your NPD partner and most likely were narcissistic supply for her. And so it’s not surprising that with the breakup she has won them over to her side. Most people are not educated in what it’s like being in a relationship or in a family with a NPD person. Unless one has gone through such a relationship and has spent the time to study and learn and reflect upon what transpired over the years most people have no clue. NPD people think they get to decide who other people are and what their role is in his/her life. They fail to see who people naturally are and they fail to see the needs of others as it’s all about them and their needs. They cannot self reflect and see their true selves and they cannot admit having faults. They give denials, make things up, accuse innocent others of doing the wrongs that they themselves do, they believe that if they thought “it” then “it” is therefore true of you, and they never give apologies. One of many difficult things a person goes through when he/she ends a relationship with a NPD person, be it a friend or family member, is the loss of most family and friends who are manipulated into siding with the NPD person. But losing such people at the post breakup stage can also be helpful as the one who decides to leave does so after much abuse and he/she needs time to get back to finding the person they used to be. They need to concentrate on their recovery. People leave when it reaches a point where it comes to their own self preservation being more important than it is to sacrifice their last bit of self to the unfixable NPD person. And the family and friends that side with the NPD ex-partner are not capable of being a support to the alienated one who left and became the NPD’s main scapegoat. Such friends and family do not understand and they do not see the manipulation and they, like most people, will focus on trying to mend what is not mendable, will focus on and pressure the one who left to move forward with forgive and forget while having no clue that forgiveness doesn’t require going back to being anyone’s doormat. They will not understand that there are some people one cannot allow in his/her life anymore. I’m not a therapist, but my personal experiences with NPD people and my graduate studies have taught me that those who reach their limit with the NPD person in their life need professional help from a licensed therapist who specializes in NPD along with other personality disorders and who understands the PTSD the survivor is going through. I hope it helps you to know that you’re not alone in your experience as many who leave a NPD spouse, parent, or family member find themselves to be alienated by family and friends who side with the NPD person. It’s helpful to focus on ones recovery, focus on ones self care, seek professional help, read helpful educational articles/books, watch online videos about NPD, and try to find new support, even try a new hobby that helps rebuild your confidence while making new friends who don’t know of the challenging time you’re coming out of too. In time some of your old friends may become wiser and may come back around, but you may also find that you’ve grown so much and become so healthy that they no longer fit in your life. You are worth the time and effort you’re putting into your self care and rebuilding of your life. No one can fix a NPD person, and not many realize at the time that that’s what was being expected of them from the start of the relationship. We can only fix ourselves. You will find your old self (the pre-NPD experience) who will welcome being with your new self, someone who’s much wiser and knows what true friendship and true love is and who knows that they will never be anyone’s doormat ever again. I wish you the best in your healing and this time of amazing growth.